Valentine's Day is all about gifts from the heart, and what's more heartfelt than our Sweetheart Chocolate Lollipops? These homemade sweet treats are perfect for sharing with friends and family. Microwave unsweetened chocolate and butter in large microwaveable bowl on HIGH 2 min. or until butter is melted. Stir until chocolate is completely melted and mixture is well blended. Add sugar; mix well. Blend in eggs and vanilla. Add flour; mix well. Refrigerate 1 hour or until dough is stiff. 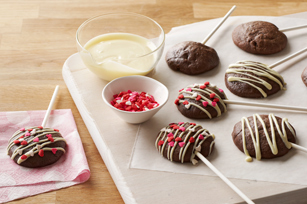 Shape dough into 30 (2-inch) balls; insert lollipop stick into top of each. Place, 2 inches apart, on rimmed baking sheet sprayed with cooking spray. Bake 8 min. or just until set. (Do not overbake.) Cool on baking sheet 1 min. ; transfer to wire racks. Cool completely. Melt white chocolate as directed on package; drizzle over lollipops. Decorate with sprinkles. Let stand until chocolate coating is firm. Coarsely chop white chocolate; place in microwaveable bowl. Microwave on MEDIUM 2 min. or until chocolate is almost melted. Stir until chocolate is completely melted. Dip fork into chocolate, then use to drizzle chocolate over pops. Let stand until chocolate is firm.